One of my favorite playlists on my iPod is one that I named “Old Skool Happy.” It contains music from Eric B. and Rakim, Big Daddy Kane, MC Lyte, Kool Moe Dee, Grandmaster Flash, Doug E. Fresh, Salt N Pepa, Queen Latifah, Biz Markie…all the songs that I once had committed to a memory that slips and sloughs away with time. However, whenever I fire up this playlist, those beats and lyrics bring me right back to hours spent pressing these songs into my mental journal so that I could spit lyrics on the playground like I was something other than a chubby white tomboy looking awkward in a dress. Those were my happy moments. Those were the moments when I lost myself in the beats and words of songs that remain just as powerful and precious to me today as they were back then. I love all the songs I used to listen to and all the artists who made them. 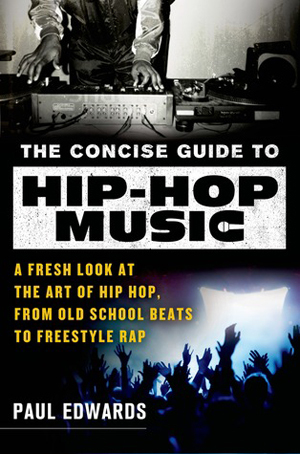 It wasn’t surprising, then, that I immediately scooped up Paul Edwards’s Concise Guide to Hip-Hop Music: A Fresh Look at the Art of Hip-Hop, from Old-School Beats to Freestyle Rap when I discovered it at the local library. I loved the music but realized that I didn’t know a whole lot about its birth and transformation. For the most part, I believe that Edwards provides a solid and certainly concise history of the birth of hip-hop. Furthermore, he does so through the words of the artists who helped craft the genre from its inception. He interviews numerous artists who even appear on my Old Skool Happy playlist, which of course made me quite the happy camper. I suppose my only complaint would be that he’s a little too precise–or rather a little too narrowly focused. I noted a distinct lack of female representation in particular in his timeline and discourse. True, early hip-hop belonged mainly to the men, but there were several strong ladies representing both early and throughout the golden age of hip-hop. It would have been nice to have heard more from and about them. Also, the book ends in an utterly abrupt way. It honestly took me by such surprise that my first thought was “Damn, this book is missing its ending.” A little work on a soft descent would have been nice, is all I’m saying. Final Verdict: I think I’d like to add this to my collection. It would make a nice reference guide and a happy reminder of the days when I used to spit mad lyrics. Yeah, I’m laughing right now, too, denizens.